This sky map shows the location of the full moon of November 2011 and the bright planet Jupiter at 7 p.m. local time on Nov. 10 to observers in mid-northern latitudes. The bright full moon of November will rise overnight tonight (Nov. 10) on the heels of severe snow storms across the United States, bringing with it some appropriately chilly lunar nicknames. November's full moon has many names, but perhaps the most timely are its "Snow Moon" and "Frost Moon" monikers since the moon hits its full phase as Alaska braces for a monster storm along its west coast, and just over a week after a huge storm rocked the U.S. east coast. The full moon of each month is actually a brief event, with November's full moon occurring at 3:16 p.m. EST (2016 GMT). But to the casual skywatcher, the moon still appears full on the days before and after the main event. "The Full Moon rises around sunset and sets around sunrise, the only night in the month when the moon is in the sky all night long," wrote SPACE.com contributor Geoff Gaherty, an astronomer with the skywatching software developer Starry Night Education, in a November skywatching guide. "The rest of the month, the moon spends at least some time in the daytime sky." Tonight, the moon will appear near the bright planet Jupiter, which is shining off to the moon's right. Both objects can be found in the constellation Aries as they make their way across the night sky tonight. 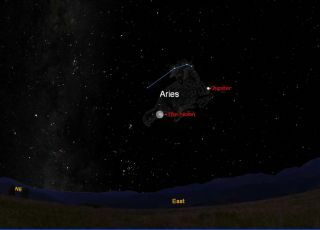 The sky map of the full moon, Jupiter and Aries here shows how they will appear together tonight. November's full moon has also been known as the Beaver Moon, though the name has two interpretations. According to one, the Beaver Moon takes its name from the animal itself, since this is the time they are actively preparing for winter. Another tale, however, states that the lunar nickname comes from hunters as a reminder to set beaver traps before swamps freeze over for the winter. Other names for this month's moon include its Hindi name of Kartik Poornima and Sinhala (Buddhist) name Il Poya, according to Gaherty. November's full moon is not the only lunar delight this month. On Nov. 25, the moon will block part of the sun in a partial solar eclipse, which will be visible to skywatchers in southern South Africa, Antarctica, Tasmania, and most of New Zealand. If you snap a stunning view of the November full moon and would like to share it with SPACE.com, send images and comments on the view to managing editor Tariq Malik at: tmalik@space.com.